James Stephenson Craig - Water maiden - Online gallery supplying original fine art. Trending Modern British and Contemporary Welsh. Available for sale from Big Sky Fine Art; this original oil painting by James Stephenson Craig, dating from around 1860 to 1870.<br> The painting is presented and supplied in an ornate frame from the second half of the 20th century.<br> The painted surface has benefitted from a light clean and a new preserving varnish coat applied in 2017 on our instructions. <br> <br> James Stephenson Craig was a British artist based in London. He painted anecdotal genre scenes and subjects from the poets. 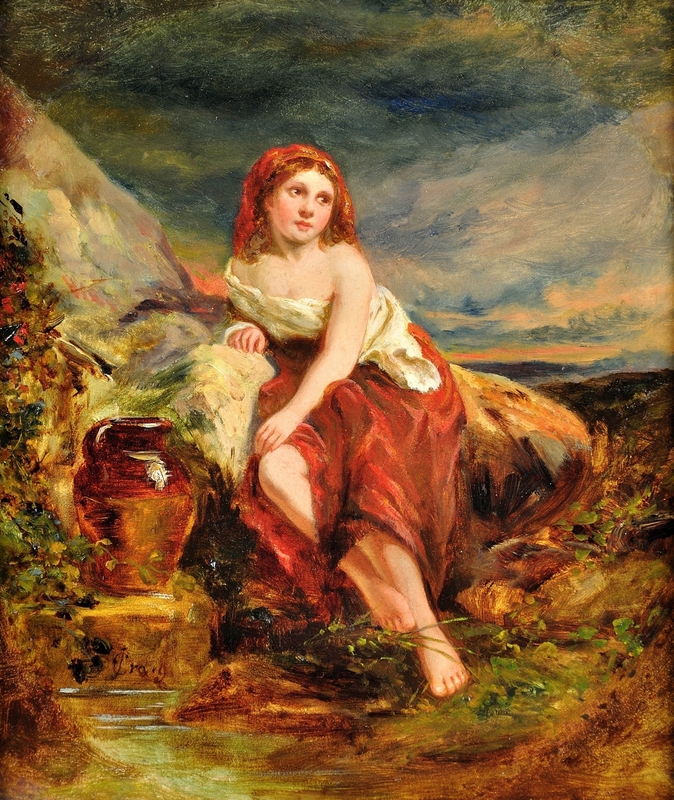 He had works exhibited in the leading London galleries between 1854 and 1870, including the Royal Academy, the British Institute and Sussex Street, later the Royal Society of British Artists.<br> <br> This charming original oil on panel, at least a century and a half old, depicts a young maiden sitting on a rock, gazing into the distance. She is wearing a red skirt and a cream covering to her upper body, but her clothing is romanticised and her shoulders, arms and feet are bare. There is a red scarf holding back her long auburn hair. Her skin is pale and smooth. She has been fetching water from the stream, and a large brown earthenware urn stands on a rock in front of her. The scenery is wild and colourful, with rich autumnal shades, and the sky above is blue with light cloud. The overall scene is very classical and serene. Available for sale from Big Sky Fine Art; this original oil painting by James Stephenson Craig, dating from around 1860 to 1870. The painting is presented and supplied in an ornate frame from the second half of the 20th century. The painted surface has benefitted from a light clean and a new preserving varnish coat applied in 2017 on our instructions. James Stephenson Craig was a British artist based in London. He painted anecdotal genre scenes and subjects from the poets. He had works exhibited in the leading London galleries between 1854 and 1870, including the Royal Academy, the British Institute and Sussex Street, later the Royal Society of British Artists. This charming original oil on panel, at least a century and a half old, depicts a young maiden sitting on a rock, gazing into the distance. She is wearing a red skirt and a cream covering to her upper body, but her clothing is romanticised and her shoulders, arms and feet are bare. There is a red scarf holding back her long auburn hair. Her skin is pale and smooth. She has been fetching water from the stream, and a large brown earthenware urn stands on a rock in front of her. The scenery is wild and colourful, with rich autumnal shades, and the sky above is blue with light cloud. The overall scene is very classical and serene.